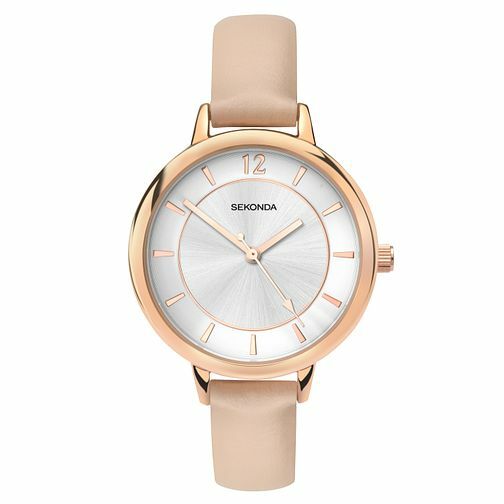 Freshen up your look with this modern ladies' watch from Sekonda Editions Summer-Time Collection. Featuring a luxurious cream coloured strap and a crisp silver sunray dial, this timepiece is finished with a rose gold plated case, hands and hour markers, for an added touch of feminine elegance. The perfect way to update your look with a contemporary edge. Sekonda Summer-Time Editions Ladies' Cream Strap Watch is rated 4.7 out of 5 by 11. Rated 5 out of 5 by Anonymous from Lovely watch Bought for my 13 year old daughter, very stylish and she loves it. Rated 5 out of 5 by Anonymous from Pleasing to all Practical, yet elegant with a dash of vitality; ideal for the modern woman.